Five spectacular gardens by members of the Dallas County Master Garden Association will be featured on the 2016 Garden Tour set for Saturday, October 1st. Visitors will see formal English gardens on Swiss Avenue, edible landscaping in Preston Hollow, a buzzing pollinator garden in University Park, native perennials and ornamental grass in Old East Dallas and landscaping for gracious entertaining in Bluffview. Make your tour complete by enjoying a seasonal Garden Brunch featuring recipes from A Year on the Plate, the new master gardener cookbook. Guests will be treated to a menu chosen from fall produce, including Iced Herb Gazpacho and Artichoke Bites. Brunch will be served on a lovely Bluffview patio shaded by live oak trees from 11am to 1pm the day of the tour. Visitors can also preorder a copy of A Year on the Plate, the new DCMGA cookbook, at the same location. Presale tour tickets will be $15 and on the day of the tour, $20 each. Tickets for the Garden Brunch must be purchased ahead at $15 each. A limited number of brunch reservations will be taken. Presale tickets for the brunch and tour will be available soon on the dallascountymastergardener.org website using PayPal. North Haven Gardens and selected Calloway’s Nurseries locations will sell only tour tickets in September. Your ticket purchase will support a major fundraiser for the Dallas County Master Gardener Association. The 2016 Garden Tour is the first time DCMGA has opened its members’ gardens in three years. Please help make the tour a success by asking friends and neighbors to attend and by publicizing the tour in venues like Next Door. All profits go to fund the DCMGA educational programs and more than 30 community and school projects. Posted in Landscape Basics and tagged A YEAR ON THE PLATE, Dallas County Master Gardeners, dallas gardens, Earth-Kind Roses. Bookmark the permalink. Are your roses exhibiting odd, thorny, or twisted growth? They probably are infected with Rose Rosette Disease (RRD), a virus that has forced the removal of thousands of roses in the Dallas area. Learn what you can do to help prevent the spread of the disease at a talk by one of the leading RRD researchers, Dr. Kevin Ong, Texas A&M University associate professor and director of the Texas Plant Disease Diagnostic Laboratory at TAMU. The free talk will explain RRD symptoms, control, and removal of infected roses and is set for noon to 1 pm, Tuesday June 21st at the Fellowship Hall of Midway Hills Christian Church, 11001 Midway Road, Dallas. 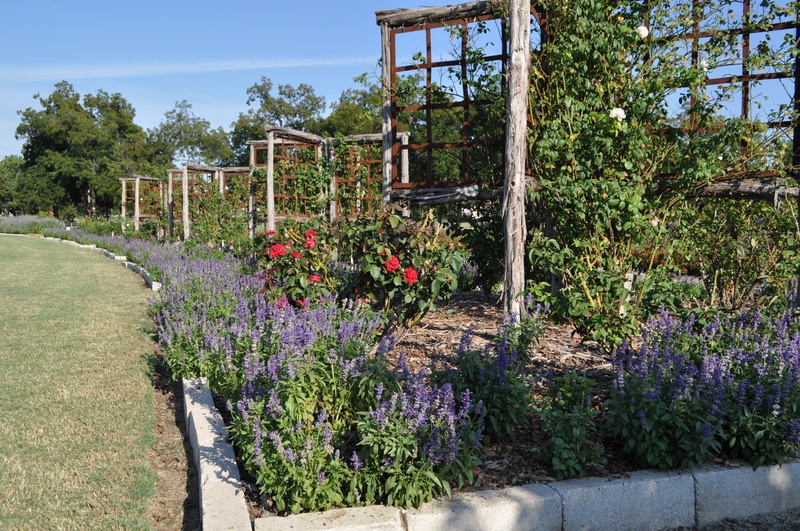 A rose trial aimed at identifying roses that are resistant to RRD was recently installed at the Raincatcher’s Garden of Midway Hills, a project of the Dallas County Master Gardeners. The DCMG volunteers are trained by TAMU AgriLife Extension Service to distribute horticultural information to the public. 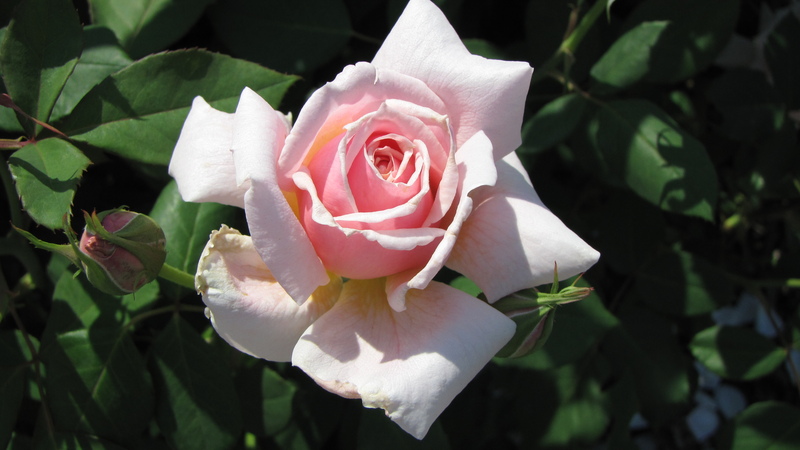 Read up on Rose Rosette Disease here. Posted in Roses and tagged Earth-Kind Roses, Rose Rosette. Bookmark the permalink. Saturday I attended the Farmers Branch Celebration of Roses. What a privilege to hear Mike Shoup of Antique Rose Emporium fame talk about “Pioneer Roses” and Scott Ogden, landscape artist and author teach the subject of Moonlit Gardens. Afterwards I happily wandered through the Farmers Branch Rose Trial gardens at 2610 Valley View Lane, Farmers Branch, Texas. Hundreds of roses are on trial in these gardens from Earth-Kind® Roses to David Austin roses, all displayed and labeled perfectly. Thanks to this description from the David Austin website, I will now be reading Thomas Hardy! Being a plant nerd, I have always wanted to see the Green Rose. Yes, there is a rose with green flowers and it is growing in the Farmer’s Branch Rose Gardens. Now that I have seen it and compare it to other rose beauties, I will be shopping David Austin and Pioneer Roses. Get to know Farmer’s Branch aka the “City in a Park”. Last weekend’s events included Bluegrass music, a chili cook off, and arts and crafts along with The Celebration of Roses. Mark your calendar for future events here. Posted in Earth Kind Roses, Roses and tagged David Austin Rose, David Austin Roses, Earth-Kind Roses, Farmers Branch Rose Garden, Farmers Branch Rose Gardens, Jude the Obscure. Bookmark the permalink. There is one symbol of Halloween that no gardener wants to have in their garden. What is it? Witches broom. Witches broom, a symptom of rose rosette disease, is the scourge of anyone growing roses. 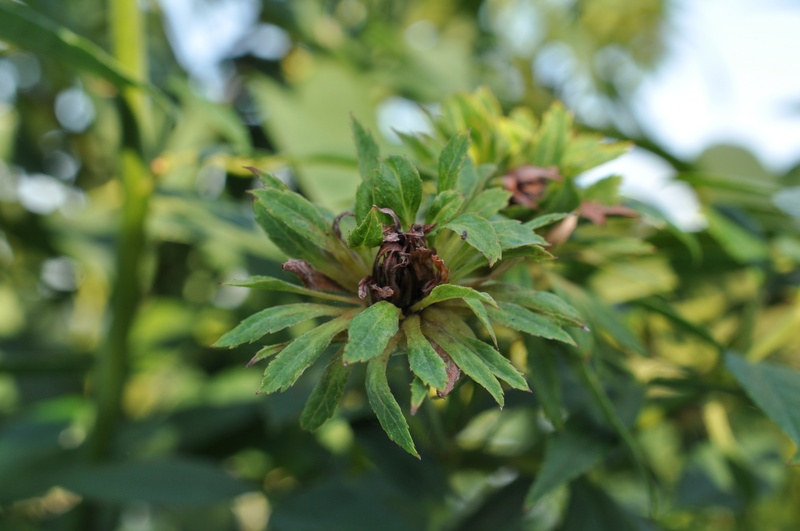 Though it was for many years considered to be primarily a disease of Rosa multiflora, the wild rose which is now an invasive species in many parts of the country, rose rosette disease has become more prevalent in many areas. Earth-Kind® roses, perhaps because they have been planted so extensively, close together, and in large groups, seem to be particularly plagued by rose rosette in the Dallas area. However any rose may be infected. 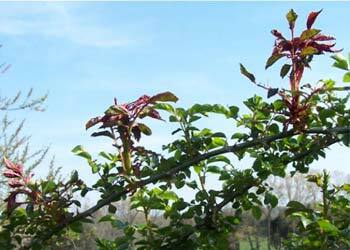 Rose rosette disease is often seen in the spring but intensifies as the season progresses. Symptoms are variable but, according to University of Kentucky’s Cooperative Extension, often include increased growth/rapid elongation of the shoots, abnormal red discoloration of the shoots and leaves, witches broom (prolific clustering of small shoots), and over-abundance of thorns. Some of these signs may at first be confused with glyphosate (example: Round-Up) or growth regulator ( example: 2-4-D) herbicide damage. 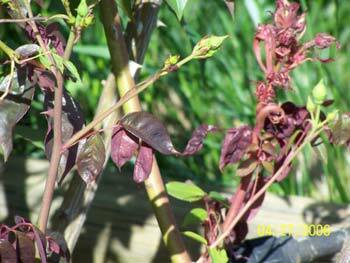 However, rose rosette disease is progressive and plants exhibiting symptoms should be carefully monitored. Unfortunately, sometimes by the time rose rosette disease is confirmed in an affected rose, the virus has spread to other roses near it. The disease causing agent has only been identified within the past several years. The rose rosette virus, called RRV, is transmitted by an eriophyid mite, Phyl­locoptes fructiphilus,, and through grafts. The mite is extremely small and cannot fly. However it can crawl, move from plant to plant by air currents, or attach itself to insects. Currently there is no effective control available for rose rosette disease in existing infected plants. However the facts that it is caused by a virus and spread by a mite give some clues as to how to prevent its spread to healthy plants. Though miticides have been tried, miticides that control spider mites are not effective against the eriophyid mite. 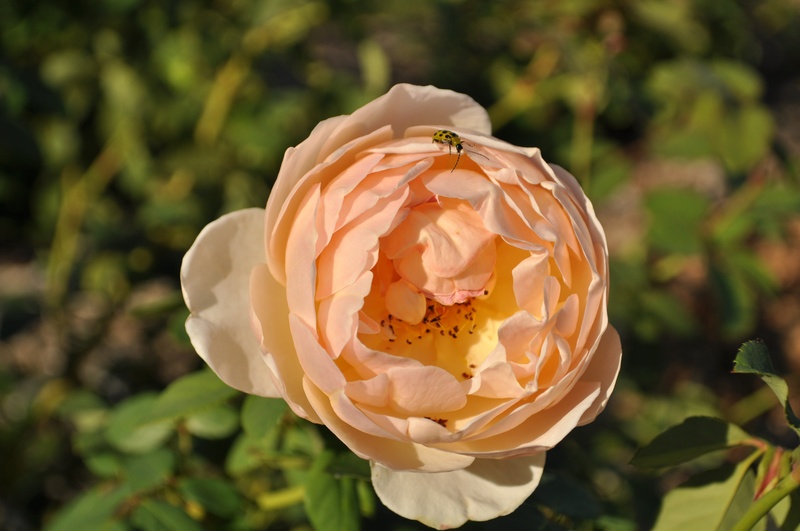 According to the Virginia Cooperative Extension, the insecticide Avid is registered for control of both spider mites and eriophyid mites on roses. However, the use of an insecticide or miticide is not recommended without using cultural control methods as well. 1) If any wild roses are present in the area, remove and destroy them. Continue monitoring them for regrowth from roots. 2) Remove any suspected roses by bagging and destroying them. Be sure to remove all the roots, both to prevent re-growth of the infected plant and to keep the virus from spreading to other rose roots nearby. It is not recommended to plant another rose in the same space, though plants other than roses can be grown there with no problem. 3) If you live in an area where wild roses are present, avoid planting downwind as the eriophyid mite can move by air currents. 4) Be sure to consider the mature size of each rose plant and space them so that the canes and leaves do not touch each other. The eriophyid mites do not have wings and must crawl from plant to plant, so proper spacing makes it more difficult for the mite to move from rose to rose. If you take all these precautions, hopefully you won’t have a frightful experience with your roses. Posted in rose disease, Roses and tagged Earth-Kind Roses. Bookmark the permalink. It takes a fearless person to prune a rose. Brandishing its protective thorns, the row of leafless bushes awaits us like the vicious magical Whomping Willow in the Harry Potter series, ready to throw us to the winds. Armed with loppers, protected with elbow skimming rose gloves—the closest I’ll ever come to Mia Farrow’s favorite length—we faced the prickly branches. Gradually the spindly support of last year’s blooms was cast aside, a faint memory of last May’s flush of happy blossoms. Old rubbed canes fell to stronger green upstarts. Eventually, a bare skeleton emerged from the entanglements, a garden star ready for its next act: its primadonna performance in the dance called Spring. Brush up on rose pruning tips here with Mariana Greene of the Dallas Morning News. Click. Click. “Oh, look at that one!” Click. Click. “Oh, wow!” Click. Cli—Wait is this the Olympic games in Sochi? No, it’s a bunch of lucky gardeners falling in love with roses. Well, the first couple of rose pictures had rose expert Vicki Agee a little perturbed; seems her vibrant red roses were coming up blue on the power point. Jim sprinkled a little fairy dust on the computer cable, and voila! The rose colors were correct, and the audience was entranced. 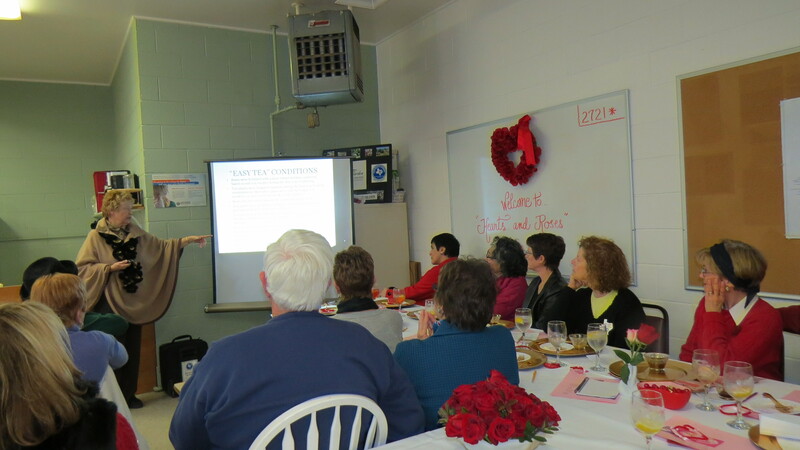 Vicki, who is also a Dallas County Master Gardener, spoke Tuesday at the Hearts and Roses luncheon held at the Demonstration Garden. 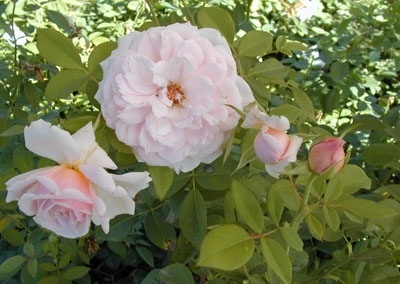 She also loves an old favorite Buck rose named ‘Quietness;’ its pale pink blooms mask its tough resistance to black spot. Easy Elegance roses, Austin roses, Flower Carpet roses, and old favorites like ‘Mr. Lincoln’: the beautiful varieties made my head spin. I wanted one of each. Vicki also knows how to take care of her roses. For fungal diseases like black spot use Neem oil for your first spray of the season. Then spray spring and fall with a product like Banner Max or Honor Guard that contains Propiconazole. Once temperatures reach into the 90s, stop spraying until fall. Vicki suggests using Spinosad for thrips, because stronger sprays will also kill beneficial insects and butterflies. Use a miticide like Floramite, Forbid or Avid for spider mites. Pyrethrum takes care of cucumber beetles. 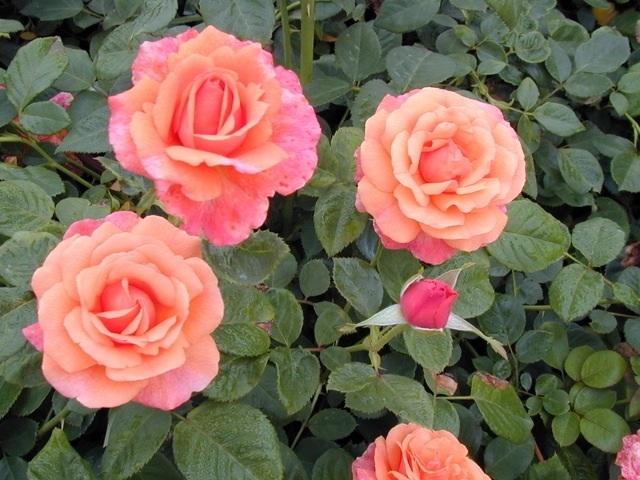 Fertilize with Texas T in the spring, and once roses have leafed out, use seaweed fertilizer every 2-3 weeks. After late summer pruning, foliar feed your roses through October for maximum bloom. An online bouquet of roses goes to Vicki for her wonderful talk and tips on a frosty February morning. I know I wasn’t the only gardener who found new favorites to add to their flowerbeds. Our thanks to Chamblee’s Roses for permission to print from their website. Click here for Chamblee’s Roses. Posted in Earth Kind Roses and tagged Dallas County Master Gardener, Dr Griffith Buck Roses, Earth-Kind Roses, Landscape Roses. Bookmark the permalink. Your check is your reservation. Make checks payable to: DCMG. Email dallasgardenbuzz@gmail.com for info about mailing your check. Posted in Earth Kind Roses and tagged Dallas County Master Gardeners, Dallas Farm to Table, Earth-Kind Roses, garden recipe. Bookmark the permalink.